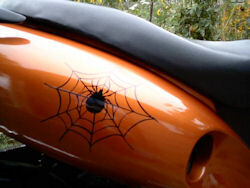 Boris the Spider loves being a scooter and taking his owner everywhere! Scooter Owner For: My "human and keeper" has owned scooters off and on all of his 60 year life span since age 15. 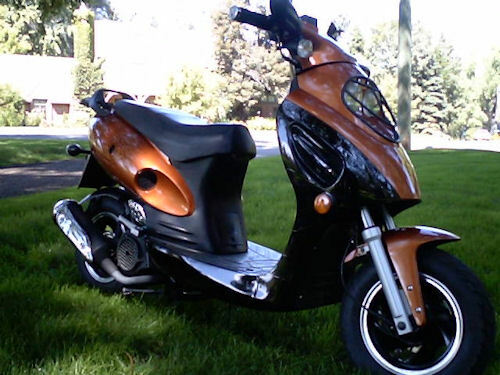 Reasons for Owning a Scooter: Because scootin' is fun!, It's good for the environment, I can save money on gas, To ride with my friends/partner/family. Also, I used to ride & build big motorcycles & it all got too expensive & attitude filled. Scooters are 100% better. 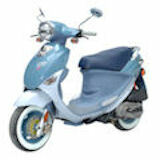 How Used: Around town, Just for fun rides, Back & forth to work, Long distance riding. I like meeting up with the people at my local Scooter shop for the Sunday rides together. Always a lot of fun with 10-20 Scooters. My Story: My owner is bashful, so I had to write my own profile here. Formally, I am Boris The Spider; a 150cc custom painted tawny gold, rebuilt Chinese scoot with custom mirrors, extra chrome, a bobbed rear fender, custom air cleaner & nice soft custom foam grips. 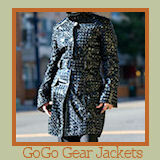 My human cares for me meticulously, and I am quite well known throughout my area. I am ridden almost daily & always well complimented on my appearance. 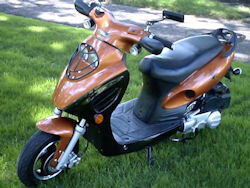 My human has a wife who now has her own (same as me) scooter that is going to get a custom face lift this winter, the same as I did! We all have fun contributing to saving the pollution factor, riding everywhere we can, getting fun attention and questions, saving money & being well kept. I park the car for most of the summer & scoot everywhere possible since retiring from work. 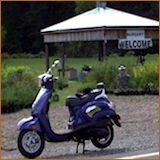 My custom scoot gets a lot of attention & I meet many other riders. 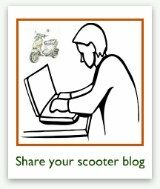 Scooters make a lot of sense, are safe, help make new friends, assist the environment & being out in the fresh air they help your health. Big thumbs up for scooters. Thank you for looking me over & giving me a space on the site. 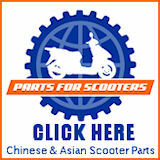 If you are Boris, build additional pages in your eScooter Club section using the form below. Let us know what's happening with Boris the Spider scooter and his owner! For Boris only... add another page to let us know what you and your owner have been up to! This box is only for Boris the Spider's updates. 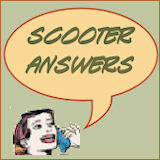 Do you have a picture of yourself, your owner, or your scooter adventures to add? Great! Click the button and find it on your computer. Then select it.